Trailer-Aid is small and lightweight allowing it to store easily and unobtrusively. It is made of super strong, lightweight polymer with clean edges that won't snag clothing or cut fingers. In fact the unit is so light it can be carried on the fingertips. The unit is guaranteed for life. 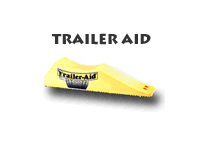 Make Trailer-Aid standard equipment in your trailer.